upgrade and modify parts for specific applications. Layer thickness is the minimum thickness of a layer that a printer can lay down in a single pass. The smaller the number – smoother and more detailed the print is, but the process will be slower. 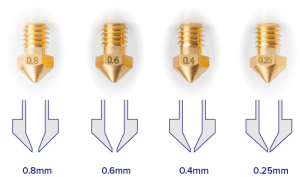 Most desktop FDM 3D printers work with layer thickness of 0.1mm to 0.3mm, but are able to create layers thinner than 100 microns (0.1mm). On the other hand SLA/DLP 3D Printers can print with a resolution down to 20 microns (0.020mm). And some manufacturers claim that they can achieve precision down to the nano spectrum of the meter. Lulzbot Taz 5/6 can achieve 0.065mm that equals 65 microns. Build area is the maximum size of an object that you can create with the 3D printer. It’s measured in XYZ dimension. For example 8 inch wide (X) by 8 inch deep (Y) by 10 inch high – 8x8x10 inches. More complicated or bigger print jobs can be split into smaller parts than can be combined afterwards. Most FDM 3D Printers work with 1.75mm or 3mm filament diameter. The trend is 1.75mm, but few of the most popular manufacturers stick with 3mm. Machines with Bolden Extruder setup work better using 1.75mm and 3D printers with Direct Drive mostly use 3mm. There are exceptions from that principle. Some people simply prefer one over the other. Or in case you own a few different brands of FDM 3D printers it’s more practical if you stick to only one kind of filament size. The Hot End is one of the, if not, the most important part of the 3D printer. This is where the plastic is melted and extruded in a little tiny layers. There are many different types of Hot Ends available on the market today. While the old hot ends (PEEK based) were able to print only with one or two materials, the new ones today can be used with variety of thermoplastics. PEEK based hot ends used to jam a lot if not maintained properly and the maximum temperature limit was about 230°C. Prints with all materials available – While some great materials extrude at 230°C or less, the most strong and durable materials for 3D printing (like Nylon, PET and Polycarbonate) extrude at temperature above 240°C. Cleaner prints – The Hexagon all metal hot end has active cooling in order to isolate the melt zone. A smaller melt zone means more control. Therefore cleaner retraction and less oozing that results in overall better print quality. Easy to maintain (almost jam free) – Fewer parts and smaller size make it almost jam free and easier to clean. Thus the focus is on printing, not on repairing. Very little maintenance is required – mainly when changing between different kinds of filament. The Nozzle is the tip of the Hot End where the plastics comes out. It needs to be exchangeable when needed. The nozzle size is really important. It usually varies from 0.25mm to 0.75mm. The most common size is 0.5mm. The best practice is to change the nozzle sizes depending on your design and desired results. Smoother finish – smaller nozzle means thinner lines extruded and smaller layer height that will result in a smoother and better looking part overall. More ridge parts – Theoretically more and thiner lines resulting in more layers will make them bond stronger than a bigger nozzle, which produces fewer layers. Practically that is not always the case. More accurate prints – in general accuracy will depend mainly on your 3D printer calibration and the settings of your slicing software. But with a smaller nozzle size you should be able to get closer to the perfect dimensions of your model. More detailed prints – in case your design has a lot of small features, and you’d like to put an accent on them, you will definitely want to downgrade the size of the nozzle. Faster printing – bigger nozzle will result in thicker strings and will reduce the number of layers. Therefore the 3D printer will make less movements and 3D printing time will decrease dramatically. Better first layer adhesion – because of the thicker strings (bigger extrusion width) there is more surface area for the plastic to stick to the bed for the rest layer. Less supports (in some cases) – Bigger nozzles can handle overhangs better than smaller nozzle sizes because the ratio between the layer height and the extrusion width is greater. But this will depend on your layer height, where the previous layer has greater surface area to support the next layer. Better reliability – Theoretically there should be no difference, but practically there is! Bigger nozzle means faster 3D printing and more room for error, thus the success rate is higher. For example the filaments diameter has some variations and with a smaller nozzle this could cause a over-extrusion that will cause a jamming problem or under-extrusion that will weaken the bond between layers which is extremely important for parts where structural integrity is our main priority. The Extruder is the part that feeds the filament to the hot end. 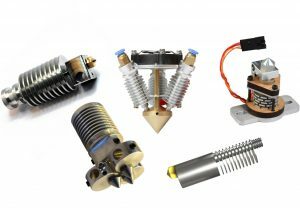 There are two different types of extruders available. It’s an outgoing conversation which one is better. Like most things some people prefer one over the other! When the filament is fed directly to the Hot End from the motor spindle. With this mechanism the Extruder is mounted on top of the hot end. It allows finer control over the extrusion and is easier to work with. The cooling fan plays a really important role in the 3D printing process and it’s a must have feature. Not all 3D printing materials require active cooling, but it’s truly beneficial for most 3D prints. Some machines use only one fan, where others can have up to 3. The cooling fan will dramatically improve overhanging features, will crisp the sharp edges, and will result in good bridging capabilities. Something important to understand here is that not all cooling fans are created equal. Some machines use a 25mm, others – 40mm. Some fans are designed to blow at the mid hot end area, some are focused at the tip of the nozzle and some have a different shaped ducts. A heated bed is required for all high temperature extrusion filaments like ABS, HIPS, Polycarbonate, Nylon and it is very beneficial for almost all the materials. It will keep the plastic warm during the printing process and prevent it from warping. Also it will ensure a better adhesion between the layers, which will result in a better structural integrity of the printed parts. Heated Bed is crucial for the first layer to ensure a good level foundation. The temperature usually will be between 40°C to 110°C and it’s not a finger friendly zone! Unheated beds can work only with PLA based plastics and TPUs , which has a lesser tendency to warp during cooling. Usually the bed is covered with PEI, PET or Painters blue tape to which the material adheres. Blue tape (painters tape) – works well with PLA and NinjaFlex. It’s outdated and better alternatives are available. PET 3M tape – works way better than Blue tape, a GOO GLUE has to be applied in order for the prints to stick. (GOO GLUE – IS A SOLVENT OF ACETONE AND ABS PLASTIC). PET tape is easy to replace and is cheaper compared to other alternatives. PEI 3M tape – Works great with the most common materials, no need for solvents and glue. Has a longer life span than most print surfaces available. It’s relatively expensive compared to other alternatives. PEI tapes is really easy to maintain – clean it with rubber alcohol or simply apply PVA “school” glue to it and it will get the job done! 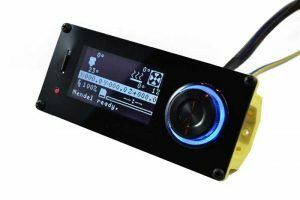 The LCD Display controller allows you to 3D print without the need of a computer connected or using a software host such as Cura. It needs a SD card to read the G-code instructions. The display allows more efficient space usage and frees up your computer for other tasks. It’s perfect for day-to-day printing and will be used in the majority of your print jobs. We can help you with the selection of some of the parts. Do you know what type of a machine you’d like to build? Use the contact form on the Website so we can get in touch with it. 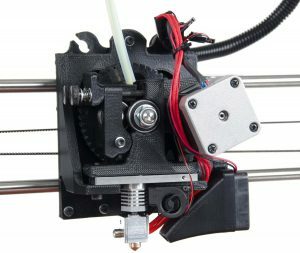 Can someone actually create a printer out of 3D Printer? Well, the answer is yes and no. 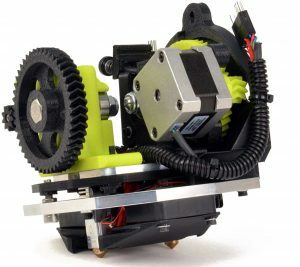 You can partially use a printer for some of the components. Most definitely you will have to buy the electronics and some hardware. 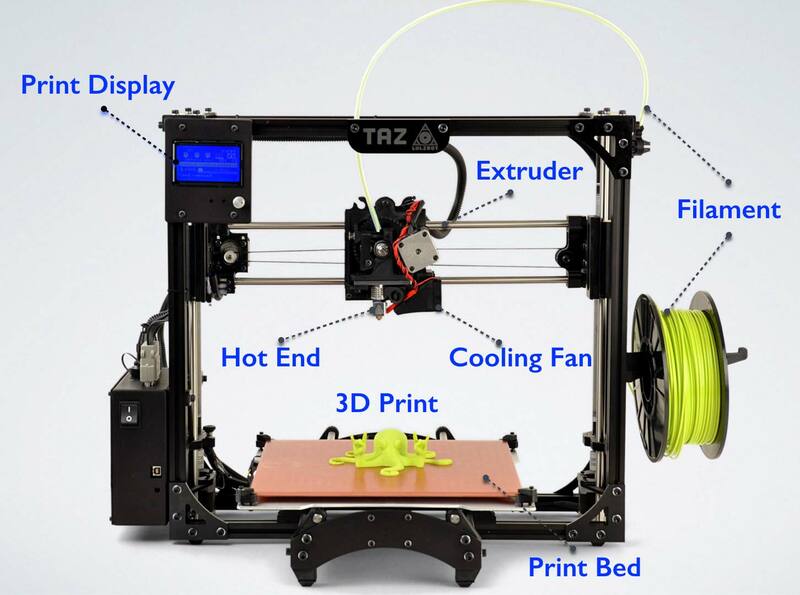 Some manufacturers claim that their machines are made out if 80% 3D printed parts. Hi. We are looking for a 3D printing solution for concrete printing. Please suggest possible variations which could work out. Hii we are designing a 3d printer for constructed houses and building bricks. What are the variation in that way. I want to make my own 3d printer what parts will i need can you suggest me? ?